At Archadeck Outdoor Living, our motto is “better building, by design.” Not only is our construction and building top notch, but our patio and deck design in amazing. When it comes to creating something not only functional (although that is goal number one), but also beautiful, sometimes it comes down to the small details of the project. 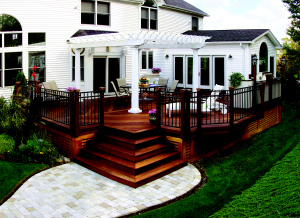 Different Decking Patterns – Decking boards are the base of a deck, but they can also be a beautiful design component. Our designers often place the boards in different patterns to define space or to make a deck a little more unique. We may use different color decking boards as well to add visual interest. Take deck for example; the boards were installed at different angles throughout the space. It enhances the space by helping to define each section of the deck. Utilizing Multiple Materials – This goes along with number one, but outdoor living design isn’t about using one color or material. When designing and installing patios, for instance, we often incorporate different materials into one project either to define or highlight different areas. 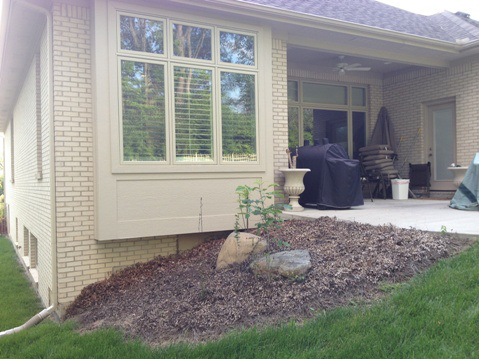 The gray stone on this patio clearly highlights the step down to the lower portion of the patio. By mixing and matching material the entire space is more aesthetically appealing. Trimming out a post or a beam. 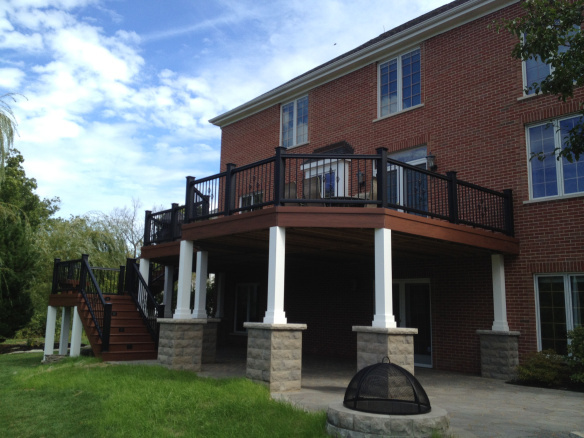 Many decks and patio require a railing to meet building codes and requirements. While they may be necessary, they can also be decorative. Trimming out a beam or a post is adding a decorative detail to make it look nicer. Sanding rail caps – sometimes the little things make all the difference. Simply sanding down the rail caps and their edges will make everything smoother and cleaner looking. Not to mention you’ll be less likely to get any splinters! Consider the stairs – stairs are another area for subtle deck design. Whether it’s using different colors for the horizontal and vertical components or placing them at an interesting angle, it all matters. These stairs, for example, are cornered and take up more space, but they create a more open looking entrance to the deck. The best patio and deck design ideas are often found in the details. Make sure you talk to your deck builder about your style so that he/she can create something that you will love. Please contact your local Archadeck Outdoor Living office if you want to experience our better building, by design. While I enjoy the winter season, it isn’t my favorite. I may enjoy cozying up by a fire in the fireplace, but I don’t enjoy running from my car to a building due to the cold. My husband and I often plan a trip or event in the spring so that we have something to look forward to. At Archadeck, we often tell people to plan their new outdoor space in the winter, not only to have something to look forward to, but also something you know you can enjoy in the spring. 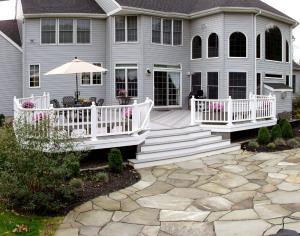 Not surprisingly, the spring and summer months make up our busy season in the porch, patio and deck building industry. As the weather warms up and people move outside they often realize that they need to improve their outdoor living space. Unfortunately, it make take weeks or months to get a new outdoor living structure built, cutting down on the time you can actually use it. At Archadeck we design and build custom outdoor living spaces. It takes time. First thing that has to be done is the design. In the design phase, we work with our clients to learn their expectations, likes and dislikes. Depending on the homeowner, we may do two or three designs to make sure it is exactly what they want. After the design is finalized, building plans are drawn and submitted to the county for permitting. No building can be done during that part of the process. Some permitting takes a few weeks to get the go-ahead for. After all of that, building can begin and, depending on the scale of the project, you can begin enjoying your new space in a few weeks. So why am I telling you all this? We want you to enjoy your outdoor living spaces as much as possible and the earlier it can be done, the better. Planning is a big part of that. If you know that next year you want to build a new outdoor structure, call your deck builder now. While the ground may be frozen (only in a few parts of the country) and building can’t begin yet, designing and planning can. The purpose of planning and designing your projects in the winter is so you can be on the top of the building list when ground can be broken. And, the earlier the building can begin, the earlier you can start enjoying your new deck, porch, patio, sunroom or other outdoor living structure come the warmer weather. 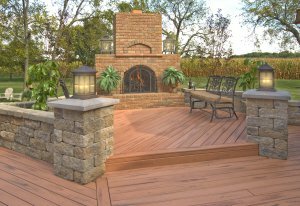 If you are interested in starting to design your new outdoor living space, please reach out to your local Archadeck Outdoor Living office. Our trained and experienced designers will work with you to create a space that fits your needs, tastes and budget. When I was little the idea of outdoor living didn’t mean the same as it does today. Back then it was a deck or patio off the back of the house were you put some basic outdoor friendly chairs to sit and enjoy a drink before dinner. My how things have changed. Outdoor living now is about truly living outdoors. From outdoor living rooms to a place to cook and eat dinner outside, outdoor spaces have come a long way. Creating rooms outdoors is all about you and how you intend to use the space. Defining the space is one way to make it feel like a real room. When creating a patio or deck design, this is something that we at Archadeck consider. Here are some popular ways of creating definition and separation for an outdoor room. deck-design-ideasShape and structure. Shape and structure are the foundation of any outdoor living space, but they are also the first thing to consider when defining different sections of a space. For example, imagine you want areas for both lounging and dining in your backyard. There are much more interesting ways to accomplish that than by having a simple rectangular deck on the back of your home. Maybe the space has a deck for an outdoor living set and then it leads to a patio for dining. Or, take this dining area for example, it has its own nook in a different shape off this deck. Archadeck 2013 PhotographyPrivacy fences and railings. Indoors it is often walls that set one room apart from another. Well, the outdoors version of walls is privacy fences and railings. They are a great way to designate different areas of a room. Also, privacy fences help to make an outdoor space really feel like a room. Take this deck for example, the lattice privacy screens around the space make it feel like a cozy place to sit back and enjoy friends and family. Pergolas. Pergolas are one of my favorite outdoor structures. Not only are they visually interesting, but they also a great option if you’re looking for a shade structure or a way to add definition to your space. Roof structures like porches and sunrooms are wonderful, but they can be pricy. Pergolas, in some instances, can play a similar role as a roof structure by defining a space, as seen in the image above. Material. One of the easiest ways to break up an outdoor living space is to work with the material of the space. We’ve had franchisees change the color of deck boards throughout a space, or use different materials all together to create transitions. If you only want to use one material, for instance decking, you can still create different areas. 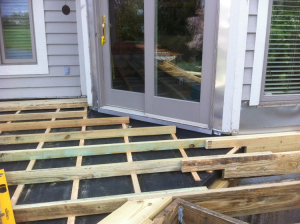 Ask your deck builder to lay the boards in different directions. If you have questions on how to create the best outdoor living space for you and your needs, please reach out to your local Archadeck office. We’ve discussed at length the importance of a good deck design. It not only has to work for the intended use, but also for the home and the rest of the yard. All components of the property should complement one another instead of combat it. When our deck builder in Little Rock, Tom Duncan, shared the following project with me, I noticed it was a great example how design can impact a yard. This particular backyard had an existing pool, but no deck. Instead, it had an enclosed area under the the small roof structure seen in the picture. The two spaces didn’t work with each other and inhibited interaction between people using the outdoor areas. The enclosed area was too small to entertain guests and the only access to the yard was on the opposite side of where the pool was. It just didn’t make sense for homeowners who like to entertain and have pool parties and barbecues when the weather is nice. Tom and his team looked to create an open entertaining space that created a smooth transition from the deck to the pool. 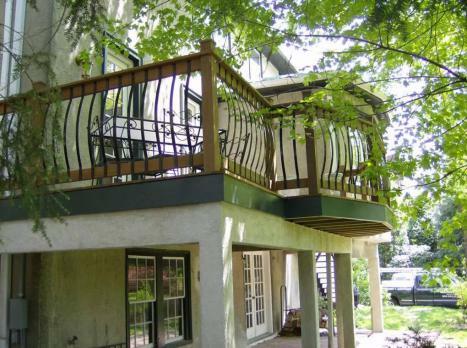 They designed a multi-level deck with wide steps Deck-builder-arkansasto open up the space. By having only three steps at any one place, the different levels, although separate, don’t feel disjointed and invite conversation and interaction between people throughout the whole yard. It also created a low-to-grade deck at the lowest level. 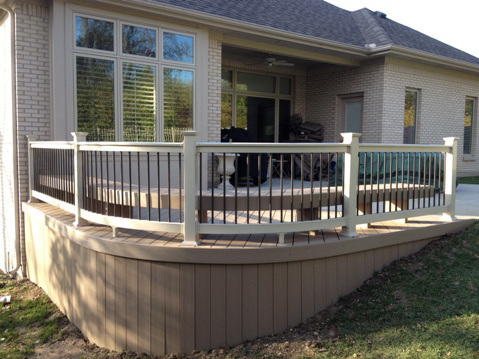 A low-to-grade deck or patio is low to the ground and doesn’t require a railing by code. Without a railing blocking views, it invites the eye out into the pool area and yard. 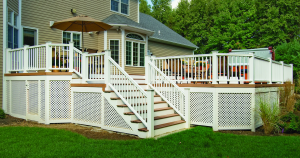 The higher parts of the deck do include a railing for code purposes, but the homeowners enjoy the definition and seclusion of those areas. Access to the pool and the yard was one of the biggest issues with the home’s existing outdoor living space, but the Archadeck of Central Arkansas opened it up. Not only is all of one side of the pressure treated deck open to the pool area, but there is also an opening from the far deck area to the yard below. This once closed off and fragmented space is now open and conducive to entertaining and interaction. There is space and areas for everyone to enjoy. The built in bench on the low deck offers a place for people to sit and enjoy the sun, while the now open porch is perfect for the person who would like some shade. It was important to the homeowners to incorporate the existing roof structure into the space. By keeping the bones and support of the structure, it was a perfect shaded addition to the structure. Tom and the Archadeck of Central Arkansas team enhanced the utility of this backyard completely by creating a space that truly works. It all comes back to design. A good design makes for a useful space. A bad design inhibits it. If you aren’t sure what will work best in your yard, make sure you consult a professional outdoor living designer. 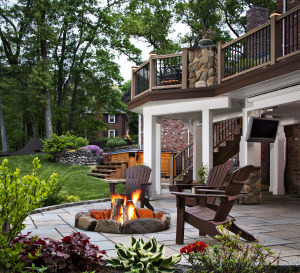 On an unrelated topic, we at Archadeck Outdoor Living are thrilled to open voting for our Dream Backyard Makeover contest tomorrow, April 23rd! 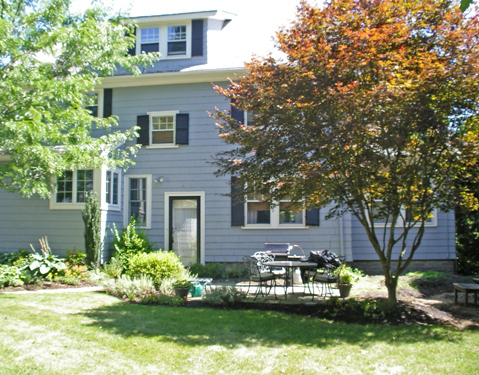 Make sure you place your vote for the homeowner you want to win the $70,000 backyard makeover! Outdoor entertaining has emerged as a large theme in outdoor living. Many people really want a place for family and friends to gather and spend quality time outdoors. When it comes to outdoor entertaining, it helps to have an outdoor space that was designed to accommodate that. A good patio or deck design will address flow and layout so that your outdoor parties are enjoyed by all. 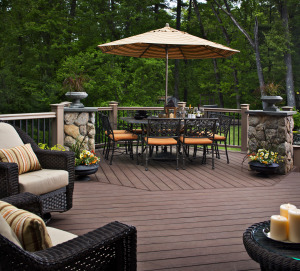 Before we get into deck design ideas, if you are planning to have a barbecue or outdoor party and have an existing outdoor structure, make sure you have a deck safety inspection if you haven’t recently. 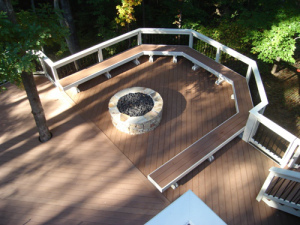 The average lifespan of a deck is 10 years, but at Archadeck Outdoor Living, we suggest having your first safety inspection when the structure is 5 to 7 years old. 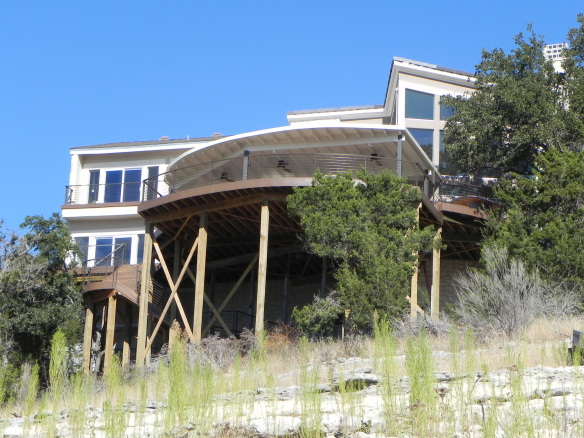 Just because the deck looks OK, doesn’t mean that it is structurally sound. A professional can come and give you an idea of the current shape of your deck as well as tell you what small fixes you can do to make it last longer. When considering a new porch, patio, deck or combination outdoor project, make sure you tell your deck designer how you intend to use the space, especially if you are looking to entertain outdoors. Be specific so they can create a space that will fit all of your needs and wants. Planning to have your guests sit around in an outdoor living room is very different than needing an outdoor dining room. Defining the different areas of your outdoor space is key to keeping the flow open and useful. 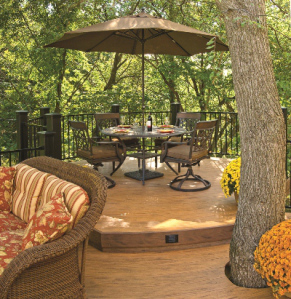 Take this deck for example, I love that the dining area is clearly defined. In this instance it was done by elevating the area a bit, but this can also be achieved by adding a pergola or other roof structure to create a “room” or by switching the material pattern. A space that is well designed for entertaining takes into account that entertaining means people and people means space to sit. For some homeowners that means an open space where they can place outdoor furniture. That allows for some flexibility if furniture needs to be moved or if you would like to switch out the furniture periodically. 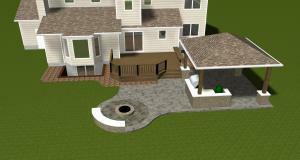 Other deck builders will include a built-in seating bench or retaining wall to accommodate guests. Normally benches or retaining walls are used both as a place to sit and a way to designate the use of the space. When people entertain outdoors they sometimes like to do the respective cooking outdoors too. For that, an outdoor kitchen is perfect, however, the design should be able to hold more than just the chef. 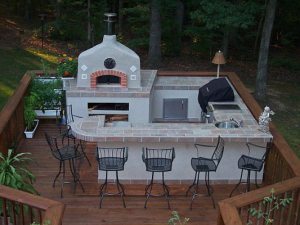 This outdoor kitchen is perfect for entertaining, for example, because it has space for people to circle around and talk while people cook on the grill or outdoor pizza oven. It keeps the chef in the middle of the action and conversation. The key to any good patio or deck design idea is that it checks off your list of needs and wants. An outdoor living structure can be pricey, so it is best to be very clear with your deck builder what you want out of the space. If you aren’t sure, download our free Archadeck Design Guide. The guide asks a series of questions that will help you envision the backyard of your dreams. I recently visited my mother and father-in-law about 45 minutes away. During our visit, my husband and I walked the dog around the neighborhood as it has expanded significantly over the last few years. While we walked around, I noticed a theme on many of the houses: elevated decks. You see, the neighborhood itself is VERY hilly and many of the lots slope in the back. The main living space is anywhere from 20 to 40 feet above the ground below. Elevated decks allow them to easily enjoy the outdoors. When properties have slopes, raised decks are a great way to provide a seamless transition between the indoor and outdoor spaces without any steep staircases connecting them. Imagine having to go down a 20 foot staircase just to throw your burgers on the grill when it could be so much easier? 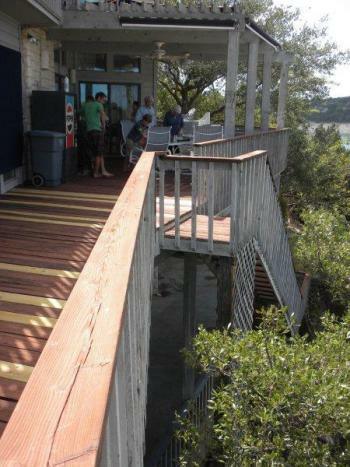 The building of an elevated deck, however, does involve more than the standard deck. At Archadeck Outdoor Living, safety is our number one priority, both for the clients and our team of deck builders and we make sure we do everything to make the process go smoothly. It’s all in the planning of the build. The first thing we look at is the skeleton of the deck. 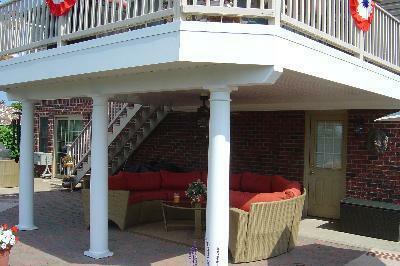 Elevated decks have to withstand a greater load so the footings are usually wider and set deeper into the ground. We also test the ground dirt to see how much it can bear and then use the required amount of cement at the base of the structure. The taller the elevate deck, the taller the support posts have to be and the better the bracing. Bracing is used to strengthen the structure and prevent any sway which can cause safety concerns, especially with taller decks. The support posts, depending on weight may need to be larger than the standard width. Different materials may also be used on elevated decks that don’t need to be considered for lower grade decks. For instance, steel may need to be incorporated for support. Elevated decks, although they can be more difficult to build, allow for some great design features that aren’t available for other decks. For instance, under decking creates dry, usable outdoor space underneath the tall structure. And porches or rooms can be added to the structure. Take a look at these great Archadeck elevated decks. I’m a true believer that when you enhance a space, whether through renovation or furniture, that you should get your money’s worth in its use. What’s the point otherwise? 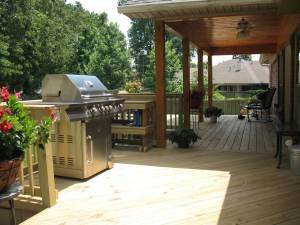 When it comes to building or replacing a deck, it all comes down to design. A good deck design will lead to it being used. I went home to Maine this summer and visited some family friends and saw first-hand how a poor deck design doesn’t work for homeowners. Our friends recently had their outdoor living space updated with a deck and patio. While it was large, I realized that all the furniture was placed in only 2/3rds of it. When I asked what they were planning for the other part they said nothing. They weren’t sure how or if they were going to use it. That area was completely useless to them, and in my opinion not worth the added cost. 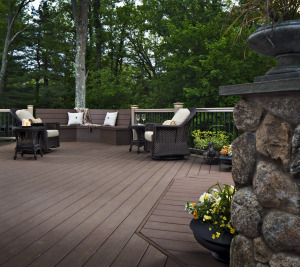 At Archadeck Outdoor Living, we pride ourselves on “better building by design.” All of our projects are custom designed to fit the clients’ needs, wants, tastes and budgets. Function is one of the most important considerations our deck designers make. How is the space going to be used normally? Will it be used as a place to cook and eat? Is it a space to have quiet time? Based on answers to questions like this, a space can be created that will look beautiful and be functional. 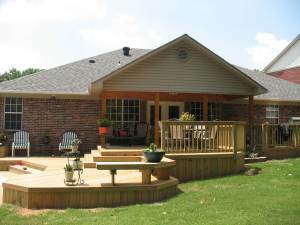 The existing home’s architecture plays a large role in deck design as well. Our goal is to make the new space look like an extension of the home, not an afterthought. I hate looking at outdoor living spaces that look like they were bought out a magazine and simply placed on the property. The style and finishes just don’t match and it just looks odd. 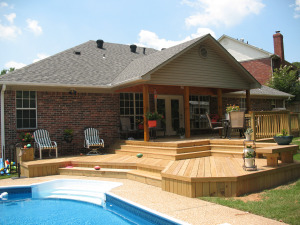 Very few Archadeck outdoor living spaces are square decks added to the back of the home. The boxy nature of a deck like that, while it works in some instances, doesn’t always allow for the flow and function that homeowners truly want. This deck in Austin had seen better days. While it has a great view (see the canal in the background), it didn’t have much space. The property owners wanted one main place for cooking, entertaining and relaxing in the sun. Below is the final outcome. It’s a big difference; don’t you agree? The outdoor kitchen is really the anchor to the space, but everything is open to the view, making it a big focal point. This home has a very contemporary architecture so our designer stuck with minimal lines and open iron rails to match existing features. This outdoor space in the greater Boston area was just too small. While the homeowners, liked the small patio area for dining they wanted a more inviting space. 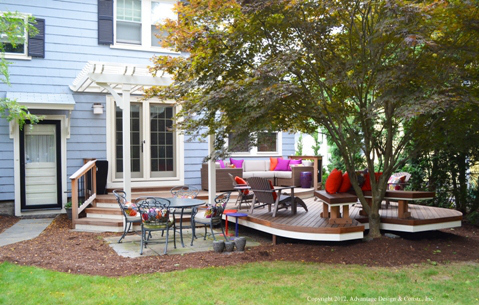 Our deck designer created a space will several areas for sitting and entertaining. By adding new french doors and a deck that’s pushed back towards the tree, it pulls people outside into the new space. I love the white trim on the deck and pergola that brings the clean white trim from the windows into the outdoor space. If you are wondering how a custom deck design could enhance your outdoor spaces, please contact your local Archadeck office. 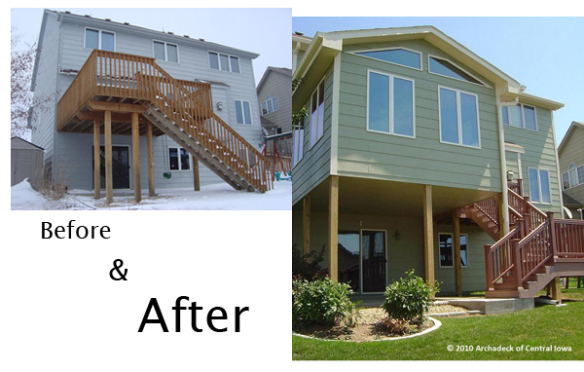 Many homeowners ask us what to do with the unused space that is located under their second story, or multi level deck. In many of these cases the area located underneath the deck can be used as an additional outdoor living space that works like a covered patio or covered porch. It can be used when the weather won’t allow you to use your deck, or as an extension of living space perfect for reading or relaxing on those warm sunny days when all you really want is a shaded spot for peace and quiet. 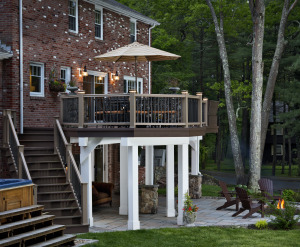 Being able to create that special spot is as simple as constructing or re-decking your multi-level or second story deck with the proper solutions to take advantage of your under deck space. 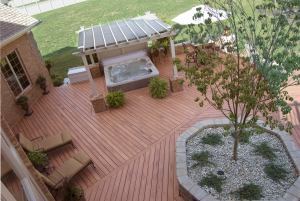 Archadeck uses a dry deck system, also referred to as a rain deck to turn the space into an oasis for you and your family. The direction of the stairs is huge! 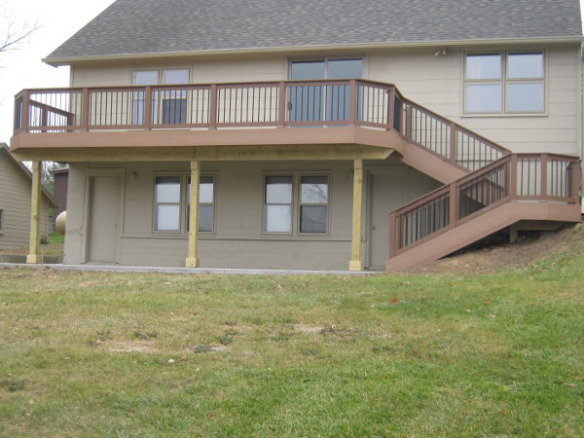 The direction of the stairs on your elevated porch or deck is a huge consideration and one that we put a tremendous amount of emphasis on when in the design process with our homeowners. Partly we do this because we realize how important it is but also because of feedback from customers who tell us what a big difference it made to have their stairs pointing toward the area where they would be congregating. If you look at the photo above, the original stair case emptied out into the side of the yard near the fence. This one was a double whammy because the very long stair case was an eye sore from the back yard. By directing the stairs to have a landing and empty out into the living area of the back yard, it made it easier to carry food and other items to their patio, made access easier and better to the back yard and looked a whole heck of a lot better. Here are some examples of stairways that direct the homeowners to the living area instead of into the side yard or away from the living area. The example above was designed by Noelalee Ragle of Archadeck of Austin. Click here to read more about this job. The existing deck had stairs that emptied out into the fence. The new deck incorporated a landing so the stairs emptied right out into the living area. The deck above was built by Baron Biedenweg of Archadeck of Northeastern Indiana. 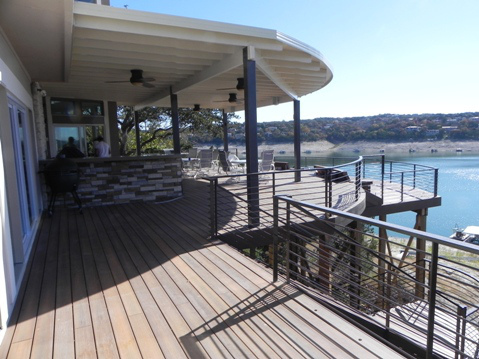 In this photo, you can see the bi-directional stairs being used on this house to direct traffic into the patio area under the deck and toward the water at this lake house. 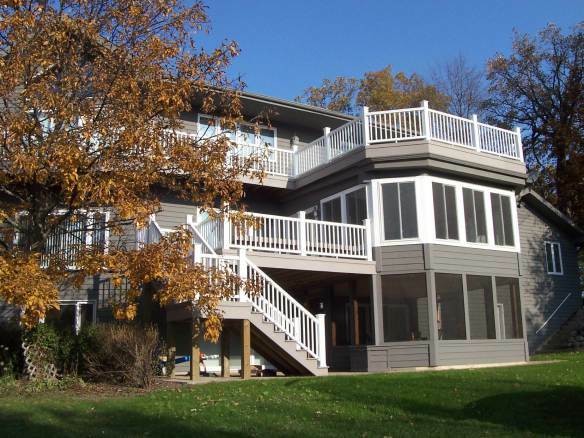 The view from the lake is also much enhanced by focusing attention on the deck instead of on a very long staircase. 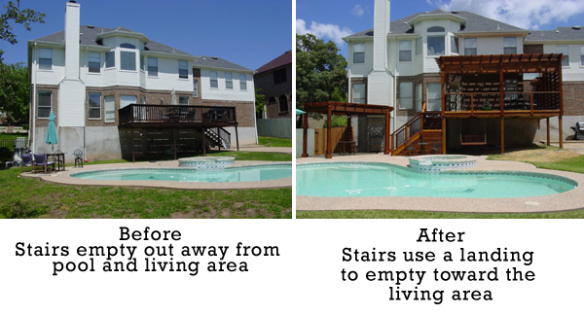 If you’re building an elevated area at your home or even a relatively low outdoor living area, think about where the stairs empty out. Think about carrying food out the door and down the stairs and how far you’ll need to walk after exiting the stairs. It’s not too early to start planning your outdoor living space for next year!! Call an Archadeck office near you now and ask for a design consultation.